At the beginning of the 19th century, hotels existed to serve only lodging guests, who ate their foot in small private sitting rooms. By the middle of the century communal dining rooms had become more common, but again were only available to tenants. 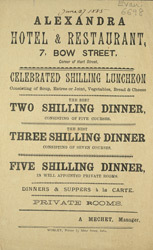 With the spread of the railways, and an increase in the number of day commuters into large cities such as London, hotels began finally to open their dining rooms to members of the public. Often beautifully furnished and serving food of a very high standard, they were seen as respectable social venues - perhaps the first in which men and women could dine publicly together without fear of social opprobrium.